My first time was in a rather upmarket restaurant in Paris. I asked for the bathroom and when shown the way I entered what surely was the wrong room, since it was only a porcelain hole in the ground. I ran out, looked at the sign on the door, went back in, and to my horror realized that hole was the toilet. Mon dieu non! I was never ever ever going to use such a thing. Yes, despite being an all around scrappy person, I have a long standing fear of public toilets. I have nightmares about them. A lot. Next to my fear of flying (more on this later), my bathroom fear has been my greatest traveling obstacle. Not just fear of dirty bathrooms, but not being able to find one when I need it. Ask at the tourist office. If you are in a larger town, look for fast food chains and stealthily sneak into their bathroom. Department stores (again, you have to be in a larger city for this) have bathrooms. Buy a coffee (but make sure the coffee shop has a bathroom first). Walk into a fancy hotel like you belong there. There’s generally a bathroom on the first floor somewhere. Free museums, like museums with histories of the town or some famous person from the area, often have a bathroom. Most trains, and even some long distance buses have bathrooms, ranging from surprisingly pleasant (you know I heart you, German public transportation) to downright disgusting. Larger cities, notably Paris, have free-standing toilet pods on street corners and squares that wash themselves down between use. They are often full. One advantage of staying in a centrally located hotel is, if you’re desperate, you can always go back to your room. Wherever you end up doing your business, come prepared. Always have a travel sized roll of toilet paper handy, and change, since as I mentioned you may need to pay, (anything from .50 to a euro). And hand sanitizing wipes–have one of these puppies unwrapped and ready to go. I must admit to being a bit surprised by your take on public toilets in Europe. 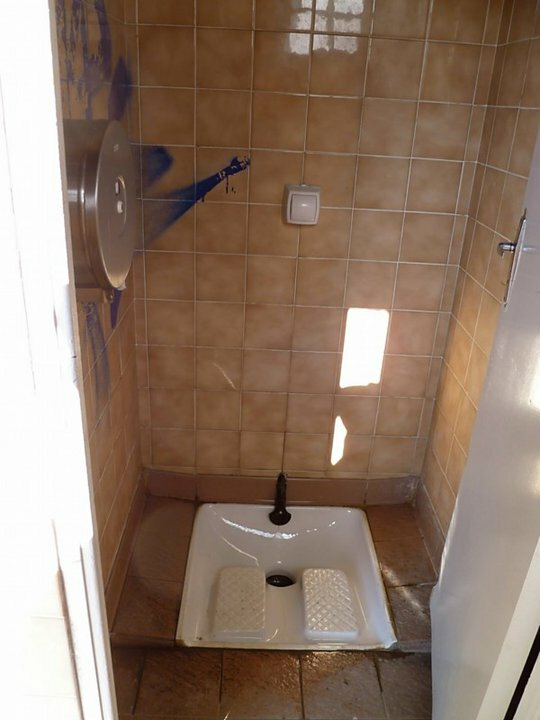 England is in Europe and I can honestly say that, while our public loos may not be always as clean as they should be, we don’t have squatting loos. BTW I heard once from an American who asked for the salle de bain in France and got a dusty answer. They thought she wanted to have a bath. 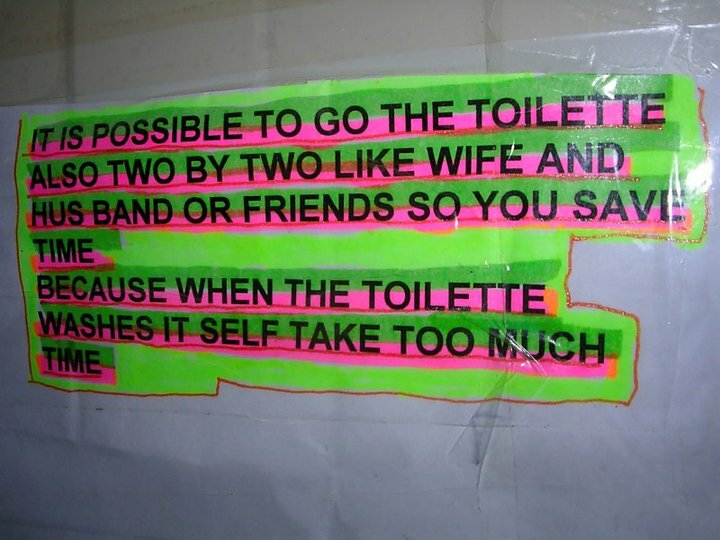 The only place I’ve been in England is London–definitely no squat loos there! Mostly I’ve seen them in France, also Turkey, and a few in Romania. They have them in Taiwan too. Oh hey, that’s good to know since we’re headed to Taiwan in January. Do you have any good travel tips for Taiwan for me? We LOVED the high speed rail. It costs only about a dollar more to get a reserved seat, and it’s worth every penny! We loved Sun Moon Lake, and the cultural village. If you are taking the gondola to the village, arrive early, and on a weekday to avoid the crowds. Travel there is relatively inexpensive–we paid a little extra–no more and often less than we would have to pay for a hotel at home, so that we could have a room on the lake or breakfast at our hotel, or a hotel in a convenient location. Where are you going to be? We had a little more than a week. We took a day trip from our hotel in Taipei to go to Taroko Gorge. It was a full day, including the train ride there and back, but worth it not to have to rent a car. It was really quite beautiful. In Taipei I would definitely recommend the National Museum. Where are you going to be staying, and for how long? Thanks for the super helpful tips Naomi. I will take your advice to reserve seats on the high speed train, esp. since it will be around Lunar New Year so the trains could be packed. We are going to be a Taipei a few nights and I’ve been beside myself with excitement about the treasures in the National Museum. We’ll also visit Hsinchu, Tainan, and with your encouragement, we’ll spend day hiking in Taroko Gorge. I want to spend some time in S. E. Taiwan too, around Taitung, but that is kind of difficult to plan. I’d like to spend time getting to know an indigenous culture in a way that is not exploitative. Good to know you found Sun Moon Lake rewarding. We’ll be there just shy of two weeks. Can wait! Okay I just about keeled laughing at your story and read it out loud to HOB. I’ve noticed that travelers love to tell embarrassing poop stories. I recently ran into a work friend at a conference and we spent like an hour talking about how she had to go in a parking lot in Sicily. This woman is the operations director of a major cultural organization in Chicago!